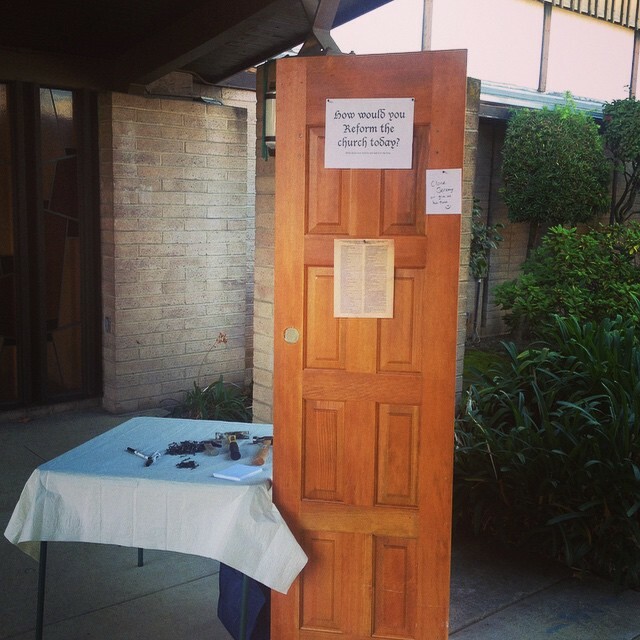 I’ve got a lot to put on this door, put up my my friend Jeremy Serrano at his congregation in CA. a sermon on Matthew 22:34-46. sorta. I love being a Lutheran Christian. I have tried other things, wandered down other spiritual paths to see what they are all about. I love being a part of a Christian church founded by rebellion through speaking truth to power. A church that began with someone seeing something very wrong with how the church was behaving and expressing the kingdom of God and doing something about it. You see, I have always aspired to be a rebel. I have never really fit in anywhere (even church), and I often have a hard time keeping my mouth shut when I think something is messed up. The Lutheran church is my spiritual home. I love that Lutherans are so comfortable in the grey space of life, that we acknowledge that life is hard and complex, that there are no easy answers. I feel at home in a place that talks about how we are all both saints and sinners at the same time. Luther’s railings against theologies of glory are more necessary than ever in our world that prefers self-aggrandizement to self-sacrifice. Most of all, I have been formed from the beginning by the idea that God’s loving grace is for everyone, there is no earning it, there is no being “good enough” to earn God’s love or eternal life. No one is good enough, so everyone is good enough. Sinners of the world rejoice! There is a place for us in the kingdom. While this is our heritage, this is not exactly our culture. I grew up knowing this joke and it’s reality. I grew up hearing about all of the hubbub of switching from the red book to the green book — for those of you younger than I or not raised Lutheran, before our current hymnal (which is cranberry, btw), there was a green one. Before that, a red one. And hoooooooo boy, was the switch to the red one a big deal. I was little when the ELCA was formed and remember all of the hand-wringing over joining churches of different ethnicity and polity even though we were, in theory, rooted in the same faith in Jesus Christ as viewed through the lens of being saved by grace through faith. Throughout my life I have heard story after story of altar guilds being torn apart over paraments and candles, of congregations splitting in two because of a move towards more modern music. I have watched the greater church split because of the ordination of women – in the process witnessing two of my pastors receive hate mail because of their gender – and again because of ordination and marriage rites inclusive of LGBT folk. I have heard tell of congregations that stick their heels in over all kind of issues, congregations mired in harmful politics and in gossip, of clergy who would rather stay safe than challenge their parishioners (to be fair, it’s our jobs if we challenge and that’s not what people want). I have known church members, staff and clergy to react in fear disguised as disgust to the possibility of new music, of guitars and screens in church. I have witnessed younger clergy and younger members get treated and pushed aside like children because their ideas just didn’t fit in with what the older generations thought of as church. We have become a people tied to the law. And not even tied to God’s law, though we are tied to that – but to things we have decided are law. Ritual, ceremony, heritage, doctrine, the way things have always been done – we, over time, have turned so much of this into laws that must be followed. We have developed this idea that if this thing or if that thing isn’t present, it isn’t church. No organ, it’s not church. No procession, it’s not church. No pews, it’s not church. The only things necessary for church are word and sacrament. That’s it. Nothing else matters. All of the rest of it is what we churchy types call audiaphora — matters not essential to faith. So far as the other things we cling to as law, some of which is actual scripture and can be found in our reading today from Leviticus, allow me to give you some Luther. “Therefore, when the law impels one against love, it ceases and should no longer be a law; but where no obstacle is in the way, the keeping of the law is a proof of love, which lies hidden in the heart. Therefore ye have need of the law, that love may be manifested; but if it cannot be kept without injury to our neighbor, God wants us to suspend and ignore the law. Thus you are to regulate your life and conduct. What matters, what really matters in ALL THAT WE DO is that we love God and neighbor. If we are not doing that, we are not fulfilling the law. What if we, and all Christians, evaluated every law with the questions, “Does this show love of God? Does this show love of neighbor?” What if we asked this question regarding the things we argue about? What if we asked this question about our jobs, our behavior on the freeway, how we treat those with less than ourselves? Think about the image of Cristendom is we all evaluated the law in this way. If we all looked at all of the laws – the laws in scripture, the laws we have chosen, the laws of our society – what if we lived this way? What a glorious world this would be! This, as we know, is not the global image of Christians. And, at least in my context, Lutheran doesn’t mean very much. It just gets lumped in with the rest of Christendom. My students and I need your help. The church, the world, needs your help. We need you to live out loud as Lutheran Christians, loving God and neighbor before all else. A couple of weeks ago, some students and I were tabling in the student union, giving away free coffee and telling people about Lutheran Campus Ministry. I had this idea that we would ask everyone who wanted a coffee a question – what do you value most. An interesting, not Jesus-y, non-threatening question. A young woman approached the table and asked for some candy. I said yes, but would she answer a question for me first. She said, quickly, “No, I would rather not have a candy then.” And she ran off. I realized that she had no idea who we were, that we were lumped in with all of the other Christians she had ever seen or heard about and that we scared her. She had no reason to trust us — in fact, she probably had many reasons to not trust us. I realized that we have to be a presence on campus finding ways to live out Christ’s love without words, finding ways to engage those who are interested in engaging with us and to just move from threatening to innocuous in the eyes of many before they would even come near us, much engage in relationship. Over the years, the Christian narrative has become a story not about God’s love for all as shown in Jesus Christ, but as a vehicle for selfishness, judgement, and societal transformation into a world of God’s law, not God’s love. We are called to change this narrative. We are called to stop arguing about the things that don’t matter – about paraments and worship styles – and to start showing the world what does matter to us. We have beautiful theology that will become meaningless if we don’t show it to the world, if we don’t stop holding it tight in our quiet, humble Scandanavian/German enclaves. Our acknowledgement of humans as sinners and saints is diametrically opposed to the Calvinist depraved human theology that is spouted by congregations like Mars Hill. People need to hear this word of grace, this admittance that while we are indeed messed up, we are also beautiful (and vice versa)! Our theology of the cross is a cure for the prosperity theology that runs rampant across our land, encouraging people to believe that what is most important is my personal relationship with God and that God wants us to be rich and happy. God wants us to be filled with joy, but that does not always mean being happy and certainly doesn’t mean always getting what we want. We are called to the cross, called to sacrifice for God. God calls us to so much more than our own happiness and we Lutherans (in theory) know this. We need to find ways to show this to the world. Note that I keep saying show, not tell. Millenials and those who identify with millennial culture are deeply suspicious of institutions and they have heard it all before. “Words, words words!” they are likely to say when they hear a Christian spouting off about God’s love. For too long they have heard those words coming from the mouths of those who would see women stay in the kitchen, and the LGBT community stay in closets or be changed, from people who claim they want to love but really, that love means “change to be like me.” For too long, the world has heard the words of love while witnessing acts of indifference at best, hate at worst. Our words have become meaningless. We have to act. We are called to love God so deeply that we cannot help but love our neighbor because to love our neighbor is to love God. We are called to evaluate law against love. We are called to ask ourselves how we live out the resurrection in our every day lives and to then to act. To live differently than the world while loving the world and, in that way to transform it. This is not to say we shouldn’t use words to witness, it is imperative. But after we have shown, after we have been asked the question, “Why do you do this? Why do you love so freely, forgive so easily, give without ceasing?” Then we have permission to say, “Because I am a Lutheran Christian and I believe this is who Jesus calls us to be.” Then we are called to shed our quiet ways to bring the good news to someone who has not seen it in action before, who has not witnessed Christ in this way. But only when we are invited into conversation after we have shown who we are will these words really matter and carry any weight.